Tangy bbq sauce and creamy ranch, paired with a quick corn and black bean salsa are a great combo! I added a little jicama to my salad because I had some leftover, but that’s optional. Place chicken breasts in a slow cooker with salt, pepper, and bbq sauce. Cook on low for 3 hours. Shred chicken. 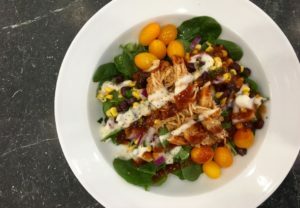 Assemble salad with greens, shredded chicken, black bean and corn salsa, and tomatoes. Drizzle with ranch and extra bbq sauce. Combine corn with beans, lime juice, red onion, cilantro, and salt and pepper. Refrigerate until ready to use. Copyright © 2017 Our Everyday Dinners - This is an easy recipe for how to make Slow Cooker BBQ Chicken Salad.